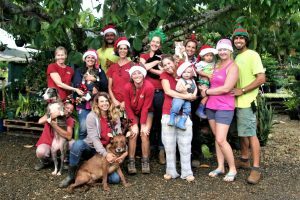 Kauai Seascapes Nursery- A Father's Day Tribute - Kauai Seascapes Nursery, Inc.
After working here for over 2 years, I was curious to get to know the man who started this incredible place through the eyes of his family and employees. I thought our June newsletter would be the perfect time to share what I found, as well as a little history about the wonderland that is Kauai Seascapes Nursery. Steve’s family, wife Mary and daughter Serina along with her husband (also named Steve, not to confuse you), now operate the business keeping it a true “Family Business”. You will often see 2 year old (almost 3) Cooper, Steve and Serina’s son, “helping” at the nursery too. Together they are upholding the vision Steve Roush had for the nursery- maybe even taking his vision farther than he could have imagined! Serina and her sister, Michelle, grew up on the property from the time Serina was 7 years old. They played softball and flew kites on the sod-farm. 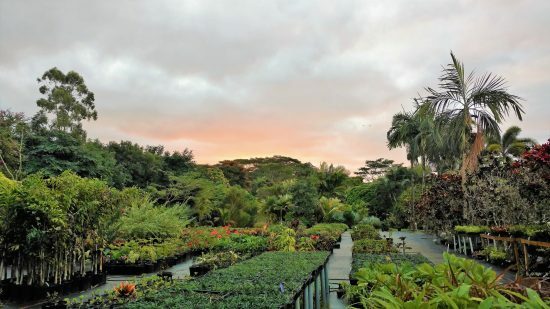 In 1992 just after Hurricane Iniki, Serina remembers helping her dad move over his plants from another property he leased to the present-day nursery. He collected plant material and seeds from jobs and over the course of 20 years built up his selection of plants. He knew every plant he had, many of the names by his memory alone. We still have a small handful of mystery plants that only he would know! Growing up, Serina wasn’t as interested in the nursery and plants so much as she is today. 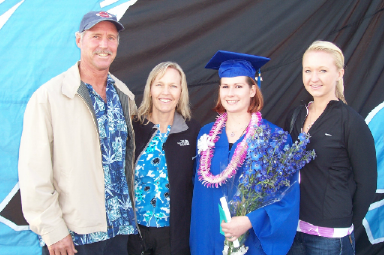 She did love collecting flowers and leaves for arrangements and leis. She knows now that that wasn’t the best for some of the plants, but Steve never admonished her for it. Serina never planned on taking on her Dad’s business, but after he passed she knew right away this is where she needed to be. She gave notice at her job on the mainland and was here about a month later. Mary shared with Serina that Steve had ultimately wanted to turn the nursery into a retail plant business that he could operate in his “retirement” and that became her number one goal. Serina also started a landscape maintenance crew for more consistent income to pay employees. This also allowed her to continue collecting plant materials for the nursery. Like her dad, Serina doesn’t waste anything that could possibly be used. You often will see a look of exasperation on many an employee’s face when Serina drives in with a truck load of materials that need to be potted at the dirtpile! “Where are we going to put all THOSE plants? !” is what we are all thinking. If you know, you know- there is never enough space at a plant nursery. 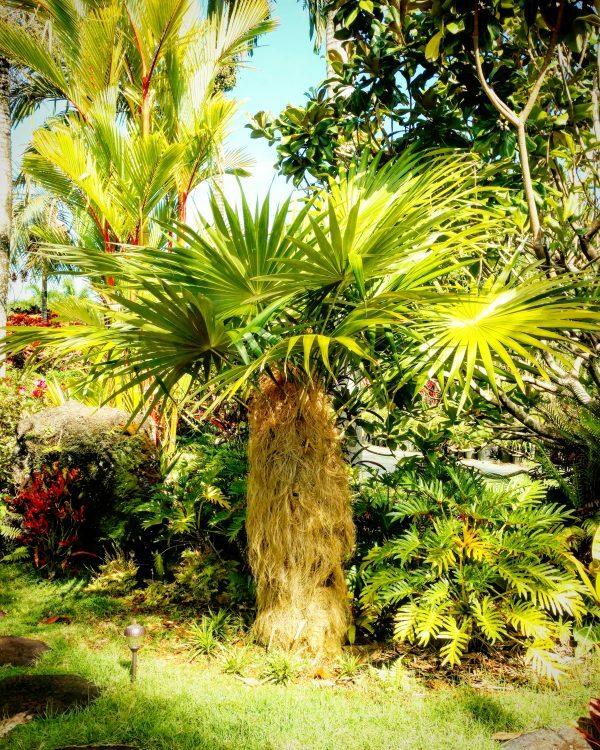 On landscape design, Steve favored “tropical island” style design and Serina finds herself drawn to the same style. One of the many similarities passed down from father to daughter. A big fan of Ti Plants, Steve cross-pollinated and developed many new hybrid Ti’s in unique and vibrant colors. He also collected and bred colorful crotons. 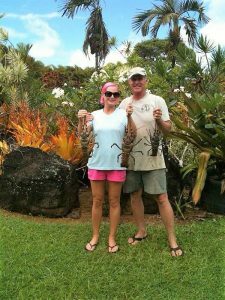 I see this love for ti plants and crotons today in Seascapes employee, Jody and in his daughter Serina. Jody is always on top of the Ti varieties- potting Ti’s, gathering seeds, taking cuttings, and propagating. And, I have teased Serina on more than one occasion of being a “croton hoarder” but she swears they are all different crotons and we need to keep them. Adrian, who worked for Steve for ten years before he passed away, is still a Seascapes employee. She was here when Steve established the Greenhouse and drip lines for the palms, as well as the landscaping and planting of mom plants on the property. As a boss, Adrian remembers him being very clear-headed and purposeful. 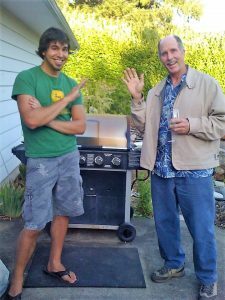 “He was so extremely knowledgeable and he knew each individual plant and their needs,” Adrian told me. This trait was passed on to our current boss, Serina, without a doubt. As a person, Adrian will always think of him as a kind man with a big heart. On a typical day, Steve patrolled the nursery before heading out to his landscaping job for the day and assigned tasks to the workers who stayed at the nursery. 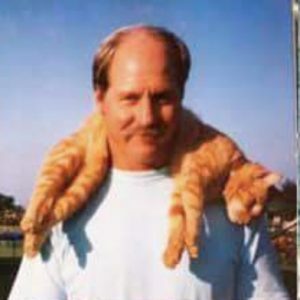 What Adrian said about these walks made me smile- “He would stroll around the nursery with the nursery cat at the time, “Butter” draped over his shoulders”. 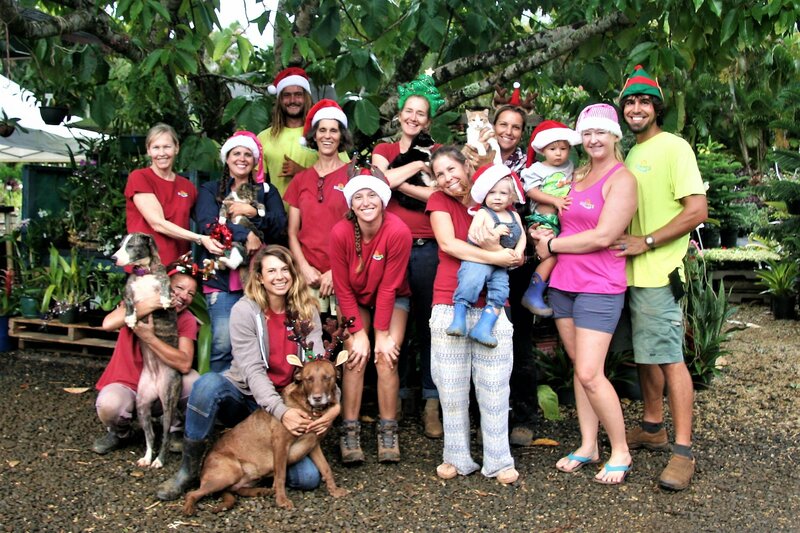 I am sure you have seen the abundance of cat photos in our newsletters and you can see that same affection for our three nursery kitties from Mary, Serina, and all of us here. When Serina’s sister Michelle comes for a visit, our furry co-workers can expect to receive extra love, attention, and care too. Roxanne worked for Steve for 3 years before his passing. She described him as being stern, but very fair. He was a “man of his word” and Roxanne had a lot of respect for him. Most all of the employees here that worked for Steve, mentioned to me that he was very big on punctuality and organization, which thrilled me beyond words. (I have a bit of an obsession with timeliness and organization myself.) Joni worked for Steve as the only young woman on the landscaping crew more than twenty years ago. 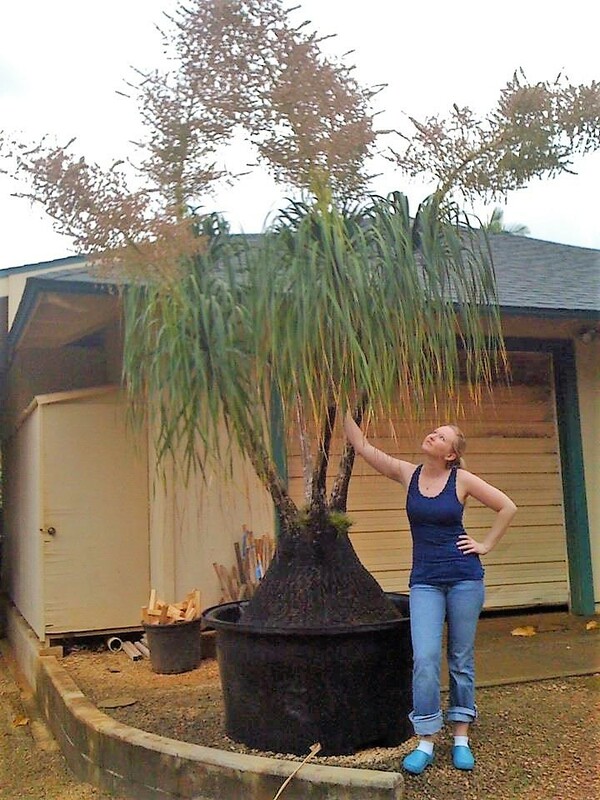 She recently came back to the nursery as one of our designers. Joni recalls Steve treating her as an equal with all the guys on the crew. She became a landscaper because of her time working for him. When she thinks of him, she sees him wearing his grass-weaved lifeguard hat he always wore and remembers him sharing fish with her from one of his other passions- free diving. 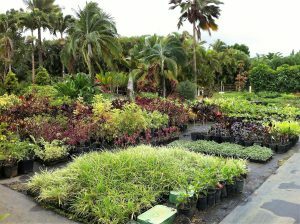 Jody remembers the nursery being a place that Steve grew good, quality plants for his clients and jobs. This still rings true today. We do our utmost to bring healthy, quality plants to our landscaping jobs and to send home with nursery customers. 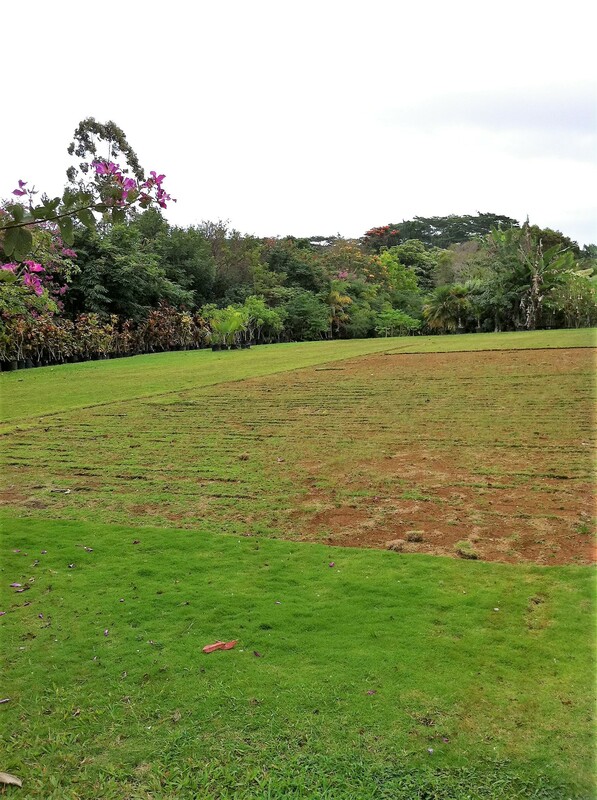 Although the plant varieties have grown substantially over the years, the three main tasks from then, are still the three main tasks now- water, weed, and propagate. Jody also recollects Steve as being clear, concise, and at times, particular about how things were done (aren’t we all?). She was grateful for his kind heart as he took her under his wing teaching her a number of things. As time passed, she started to refer to him as her “work dad”. With family being far away, it was a comfort to have a hanai family. That is very much the feeling you get when you work here, Jody nailed it with that description. The hanai family has grown and now Jody’s youngest son Kash (almost 2) comes along to work some days. Everyone pitches in on keeping track of the two energetic toddlers (Kash and Cooper) when they are here. (They can disappear from your sight so fast!) I can see them both learning the ways of the nursery before Kindergarten. It was Mary who helped me to see the most how big of a heart the founder of our nursery had and helped me to understand his hopes for the nursery. Steve wanted more than anything to have his work become a retail nursery open to the public- a goal that was realized after his passing by Mary and Serina. Prior to his passing it was open by appointment to other landscapers and potential clients. When Steve fell ill, he encouraged Mary to sell the property. None of us are strangers to the expenses that can pile up when you or a family member are ill and of course his thoughts were about what would happen to his family after he was gone. But Mary could not do that as she loved living here and loved the nursery too. There are so many of us thankful for Mary holding on, and with Serina, seeing the nursery through to opening to the public. Mary thinks Steve would be flabbergasted by what the nursery has become today and that he would probably rib Serina about all the “frillies” she has brought into the nursery. The overwhelming consensus I heard from all those who knew and worked with Steve Roush, is that he would be insanely proud and humbled by all the dedication and hard work it took to make the nursery what it has become today. It has grown on the landscaping and design side with 3 designers and a crew of hard-working young men and women out at job sites. 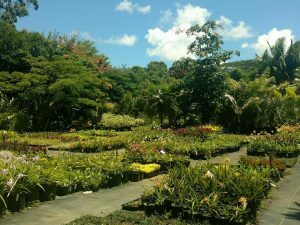 The nursery business has also expanded requiring additional employees with an increase in the variety of plants sold, grown, and propagated. Nursery work is hard work and it is not for everyone, but Steve made a place so wonderful to work that employees fall in love and take pride in their work here- and end up staying for years! He probably never knew the impact he had on this nursery and his employees. He could not have predicted the impact he would continue to have in this place he imagined and built. You can see his ‘footprints’ in the collection of plants, the presence of the nursery cats, and most noticeably in the passions and habits of those who learned from him. 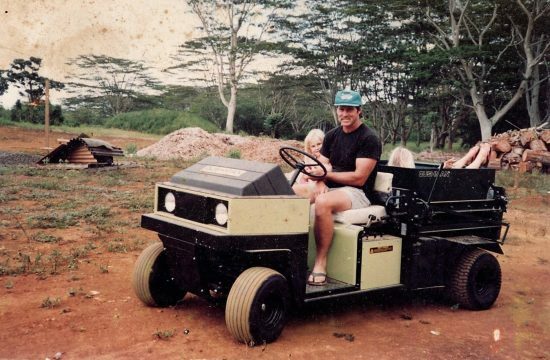 The foundation Steve laid for this family business has flourished and he would have every reason to pat himself on the back for what he started, but since he’s not here to do so, this is our “atta boy” and big mahalo to him for being the Father of Kauai Seascapes Nursery. Aloha, This is a nice tribute to Steve, just one little correction for you. Hurricane Iniki was 9/11/1992. 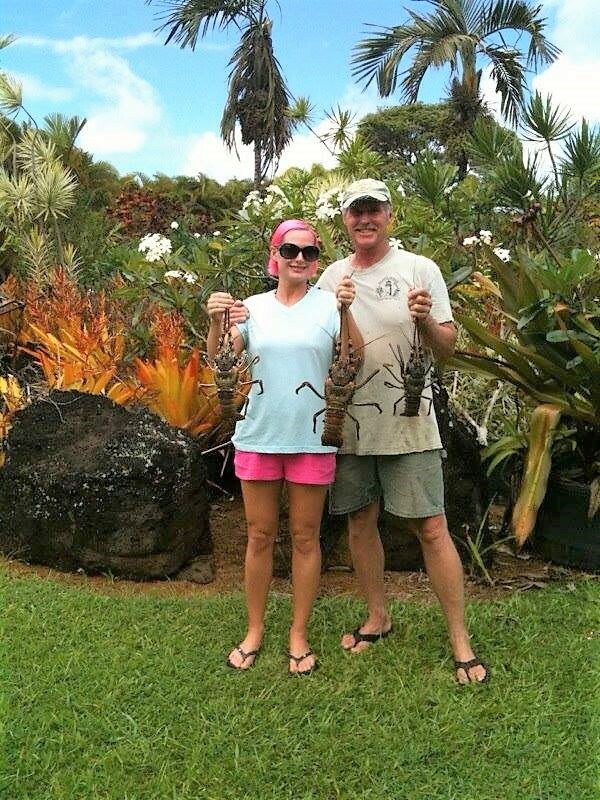 I worked with Steve at Chuck’s Steak House when he first over to Kaua’i years ago. He was a great friend and was everything you said he was. I’m so glad his Ohana is carrying on .